Four reasons to let Excel Pro Service LLC clean your gutters. Water Damage - Gutters protect your home or building from water damage. Without gutters, water would pour off your roof on eroding landscaping and pool next to your foundation. Then it is only a matter of time before this surplus of water finds a way through the foundation and into your home or building. Clogged gutters do the same thing. 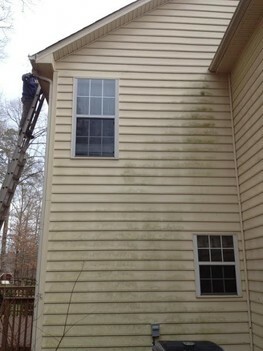 Let Excel Pro Service LLC clean your gutters and prevent further water damage. Structural Damage - As gutters fill with debris, they become heavy, increasing stress on your eaves. Nails begin to pull, wood begins to crack. More debris accumulates, seeds sprout, trees and plants begin to grow in your gutters! A heavy rain or an ice dam is all it may take to pull a clogged gutter down. Also ant's like damp clogged gutters. They often setup a nest inside your home, close to damp clogged gutters. Excel Pro Service LLC will help preserve your home. Time - Excel Pro Service LLC's technicians are up and down ladders all day. Save the time and trouble of pulling out a heavy ladder and moving it around your home or building, pulling muck out of your dirty gutters. Priced just right, Excel Pro Service LLC will quickly clean your gutters and preserve your investment and your time. Safety - Do you really want to be on a ladder or on your roof? Excel Pro Service LLC technicians are trained in ladder and roof safety. We'll clean those gutters while you stay safely on the ground! Also, did you know that bees and wasps sometime make homes in or near gutters? Stay safe and let the trained professionals at Excel Pro Service LLC take the risk. Excel Pro Service LLC is a leading provider of gutter cleaning services. Our expert technicians have years of experience on ladders and roofs and can make your home, office building, apartment building, or restaurant gutters work like new again. We will ever work around your busy schedule. Excel Pro Service LLC technicians are insured and have the required licenses and certifications to work safely on ladders and roofs.